The cupcake craze has seen all manner of flavours hit the shelves, from apple crumble to bacon and maple syrup, but at $45, Crave Cupcakes’ latest creation could take, well, the cake. On sale from today, the limited run ‘golden cupcakes’ are made from single origin chocolate with raspberry and macadamia added. 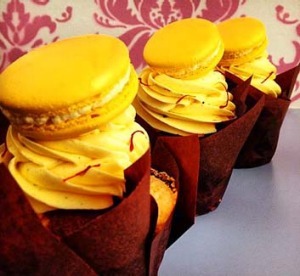 The mudcake is then filled with a salted caramel sauce and topped with a saffron and orange blossom icing. Sound like $45 worth? Well, the piece de resistance is the champagne flavoured macaron (made from Moet, of course), sprinkled with gold dust. Chef Jason Janetzski experimented with the cupcake for three months. He’ll make two dozen of the cupcakes before heading back into the kitchen to come up with his next creation. Orders close on August 14. “Cupcakes are like a blank canvas, you are only limited by your imagination.” he says.